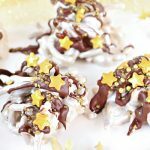 This easy New Years Eve Haystacks recipe – with chow mein noodles and peanuts – is a sparkling and shimmering treat to enjoy while you wait for the clock to strike midnight! Line a large baking pan with wax or parchment paper and set aside. Add the peanuts and noodles to a mixing bowl and stir to combine. Set aside. In a Wilton candy melting pot or double boiler, melt the white chocolate candy melts over low/medium heat, stirring occasionally. Remove from heat and allow to cool for 1 minute. Pour the melted white chocolate on top of the peanuts and noodles and gently toss to coat completely. Using a tablespoon or cookie scoop, transfer the mixture onto the lined cookie sheet in the shape of “haystacks.” Lightly spray each haystack with the Wilton gold or silver metallic sprays (your choice). In a small microwave bowl, microwave the cocoa candy melts for 45 seconds. Stir until completely melted and smooth. Drizzle the melted chocolate on top of each haystack. Immediately sprinkle with gold or silver candy balls and golden star sprinkles. Store the haystacks in a single layer in an airtight container for up to 2 weeks.